What was your sporting highlight of the year? Here’s some of the moments we witnessed. 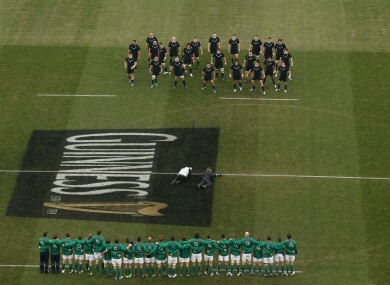 Ireland's rugby stars face the haka in November. PHEW! That was some year of sport. Some of our writers get in the way-back machine to relive some of their highlights of 2013. When Dublin won their first Leinster hurling title in 52 years at Croke Park. It was a great game, with Dublin dominating the early stages before Galway threatened a dramatic late comeback with two quick-fire goals. However, the Dubs held out for a deserved victory amid an emotional finale – it was obvious how much the victory meant to the players and a tearful Anthony Daly, while the game also ultimately became an integral part of one of the most exciting and unpredictable years in hurling in recent memory. I’ve never been at a match like the All-Ireland football semi final. Rivalries like Dublin v Kerry carry so much baggage it’s not unusual for the anticipation to dwarf the event, but not this time. The two powerhouses stood toe-to-toe, both playing the game the only way they know and neither willing to give an inch. In 20 years’ time, people will still be watching this, reliving the majesty of Gooch and the sheer determination of Michael Darragh MacAuley. It was just special. Ireland’s near-victory against the All Blacks was the best sporting event I was at this year. The atmosphere, for the first time at the Aviva, was incredible and the game itself was of the highest quality. Ireland were superb for much of the game, but the All Blacks stole it at the death with that skillful, composed passage of play. The performance set a standard for the Ireland team to repeat in 2014. Between Leinster and Ireland, Brian O’Driscoll has played 11 home matches this season. I was fortunate enough to be at six of those games. I was at Lansdowne Road to see him take to hefty blows yet some how still be on the pitch in the 13-13 draw with France. I heard the ‘one more year’ chants as he scored against Biarritz. I was back at rugby HQ to witness the between the legs scoop against Samoa and the humbling against the Aussies a week later. The game that stood out, however, was Cardiff Blues at the RDS in September. O’Driscoll played with the freedom of a lad enjoying a hit out on the local green. A joy to behold. When Clare hurlers returned to Croke Park for their semi-final against Limerick. On a personal note, it was brilliant to see my mother – a Clare woman – see her team back on top and reaching All-Ireland finals. The day topped off by sitting inches from both Joe Canning and Anthony Daly. PS. If the last 20 seconds of the All-Blacks v Ireland had gone differently, so might this entry. Croke Park, 8 September, 2013. The drawn All-Ireland hurling final concluded in an amazing fashion with a relentless series of twists and turns. Anthony Nash struck a goal, Clare hit a few points, Patrick Cronin bagged another goal, Patrick Horgan lobbed a superb point before Domhnall O’Donovan became the most famous scoring corner-back in hurling history. It was draining, riveting and made for the best sporting event I was at this year. Cork’s tense All-Ireland semi-final win over Dublin will be remembered by Blues as the one that got away. Patrick Horgan’s opportunistic goal got the Rebels back into a game that was going away from them but Ryan O’Dwyer’s controversial sending off gave the Leinster champions too much to do. A thrilling game in a ridiculous summer. What was the stand-out event you were at this year? Fergie ‘won’ £50k on Who Wants to be a Millionaire… how would you have done with his questions? Email “Rattling the All Blacks and GAA gold - I was there in 2013”. Feedback on “Rattling the All Blacks and GAA gold - I was there in 2013”.